8H. Definitely the chase is on here in my neck of the woods. Witnessed 3 different bucks in the last two days chasing doe. Doe do not seem at all interested yet. A big increase in scrapes and rubs this week. 7P saw 4 doe a spike in between the times I saw the doe. No fawns with any of the doe. Pulled my card no new bucks but a little 4 pt working a mock scrape and a pic of a doe using it also. 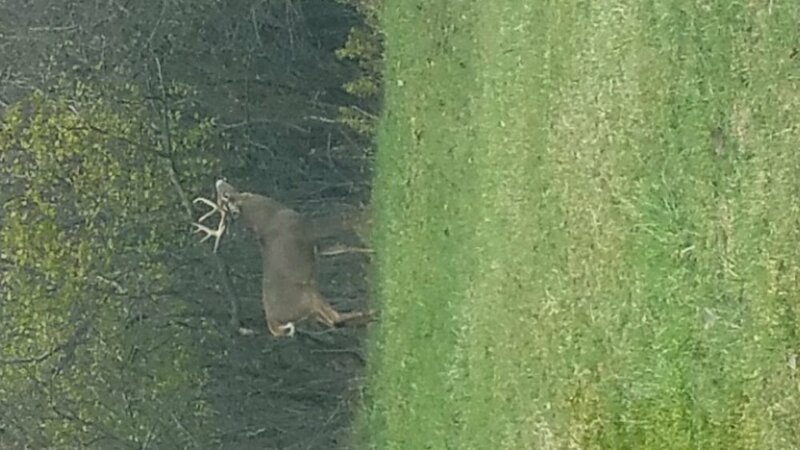 Saw 2 the first two rubs of the year today in 7f. Yesterday, 1c, saw 2.5 yr old buck following doe. 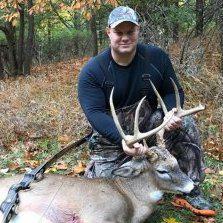 Buck made scrape and showed interest in grunt call, but not enough to come in to challenge. I would not call that chasing, but certainly buck was more interested in the doe than in cheching out what/who grunted. So how far do we think we are from the rut? I started seeing scrapes about 3 weeks ago. Now I am not seeing them being used. But I still have bucks on cam after hours. I also have found no rub lines this year. Is it the weather? Or my property? 8J scrapes are still being used every day. Haven't seen any bucks with does, harassing, seeking, trailing or anything. It's just gotta happen soon though! On my way home from work, I saw a big, wide 8, stocky fella on his feet getting ready to cross a road. Neck was thick, and he was a proud fella. 4K, 5:35 p.m., 60 degrees. Field edge. Does were in field. 4U Pulled cams activity picked up mightily. 10/31 @ 6:04PM Saw a 5 pointer chasing after doe on driveway of my property. Then about 3 hours later he was about 130 acres away on the OPPOSITE side of the property below the ridge that acts as the eastern property line. The previous evening, up on top of that same ridge ridge a 7 pointer the next day was spotted at about 10:56PM, although he did not exhibit any rutting activity. Heavy nighttime doe activity, they seem to not come out during the day as much. 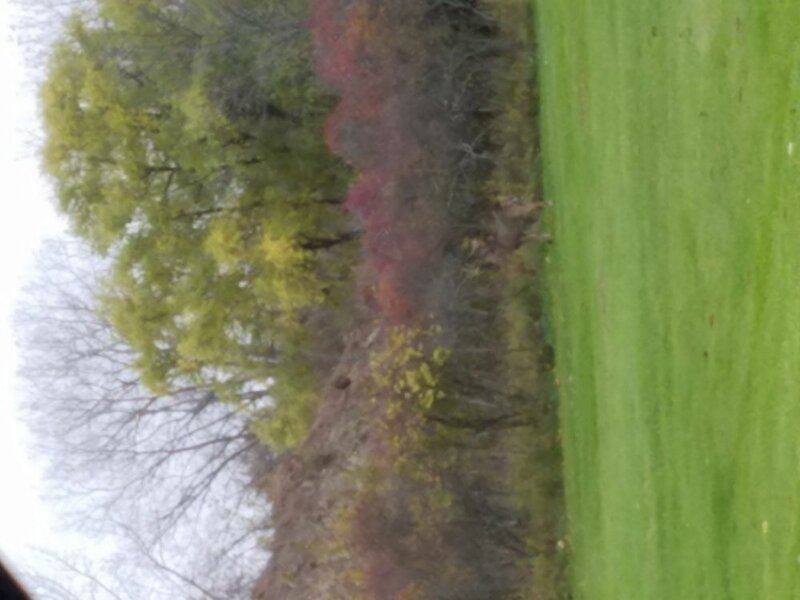 Saw a suburb Buck at a licking branch around 10:30ish am about 10 feet from the road 11/5. 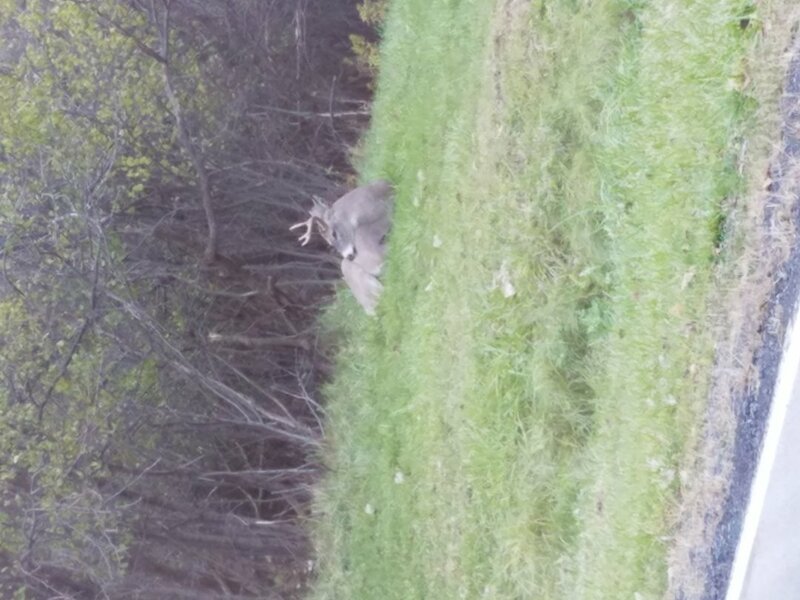 Saw a big buck 11/2 in the afternoon. No pressure around here though (city of Tonawanda). He was taking his time walking around. I came back down the same road around 1pm and there was a very tired looking buck (smaller) with a busted rack bedded down. I think he got a little beat up. My view: The bucks are ready, but no pressure (suburbs) has them feeling comfortable to check branches, rubs, beds, etc during the day. Where the 'woods' bucks are only coming out when they feel safe, which is primarily night. I think next week they won't be able to resist and will have to start coming out during daylight hours. Is this a correct assumption? Bucks are definitely moving during the day in 8H. 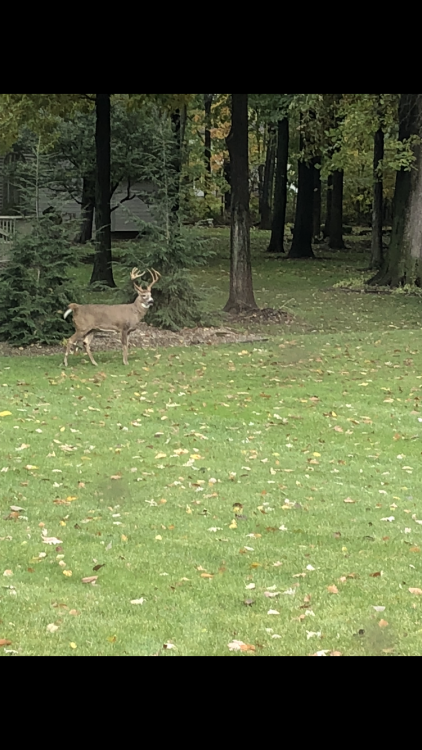 This big suburban boy was chasing a doe through a Penfield neighborhood last week. 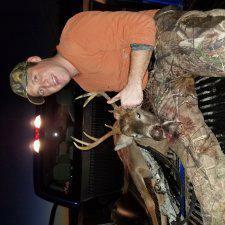 Sweet, untouchable buck... will die of old age if he stays in that area. If he wanders and someone gets him, show us pics!! There are many nice suburban bucks in these no hunting towns. And they trash all the nice expensive suburban landscaping. He,He. 7s first does are in heat and the big boys are locking them up. Ha! Actually that picture was taken less than 2 miles away from you! Saturday.. Large buck in a field about 1030 AM with his eye on a doe. He didn't move, didn't notice me or anything. Did not look like chasing or in heat but serious interest. 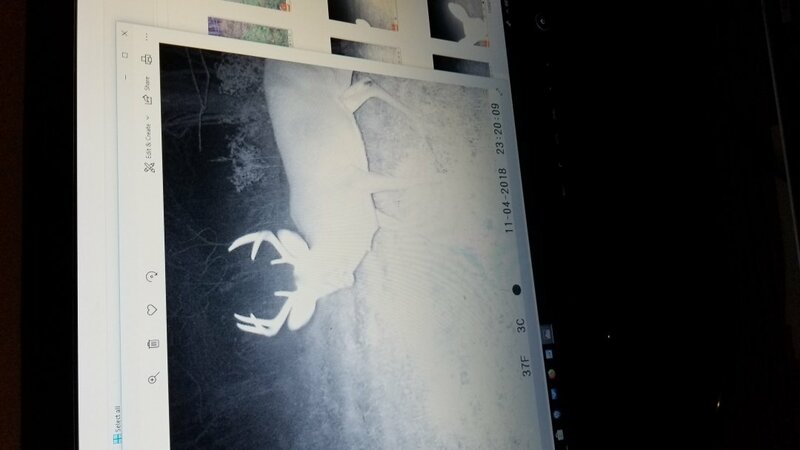 Nothing on trail cams at night or day for that matter. Nothing moving. I am assuming its lockdown time in 7J right now. Nov-9, 4J, Albany area. Saw a young buck and few Does that were 40-50 yards away. they didn't pay any attention to each other. 3M- 2 guys I know both got nice deer this week, a nice 9, and a good size busted up 8. Yesterday, I finally saw legit chasing from the stand right at 4pm. Spike chasing a doe, full on sprint, back and forth, from one end, to the other, big circles, etc. He did stop at 10 uards, his mouth was open, tongue hanging out all fired up. That morning, I saw a very big buck way out probably 80 yards id guesstimate, but he was simply walking slow, and steady. This stand had a lot more action than this last year, a week earlier. Seems like things are a week, or so behind from last year, on this property. Oh, and I commute to 3K on my way home, and the drive home was active with deer being careless, jetting across roads, a few new road kills is uncommon spots, etc. I have observed several spikes walking around at all hours of the day seeking. Some scrapes are still active as well. 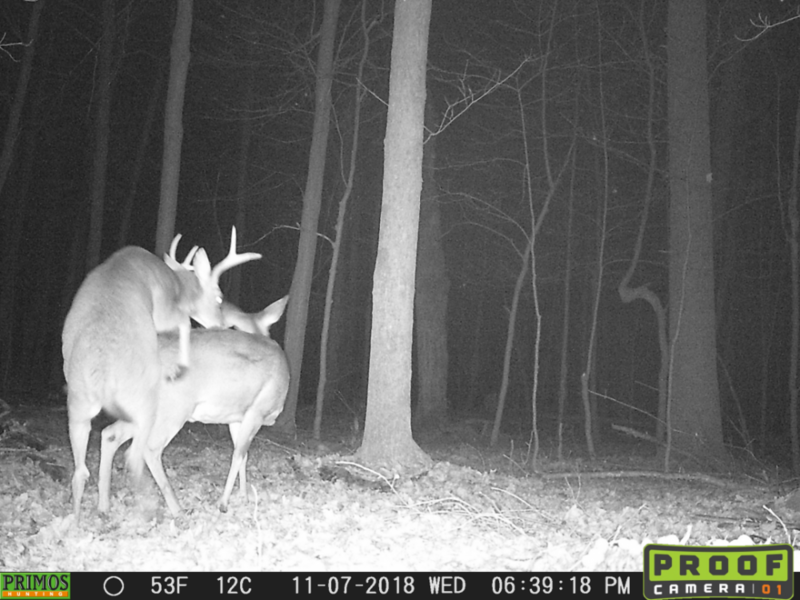 Multiple bucks seen seeking and one seen tending a doe. Scrapes still active and a large print in one suggests it is not just the spikes hitting them. We will see if the rains prompt refreshing of the scrapes. In my neck of 3K I feel bucks have just started searching as of friday night.